The VASWCD Educational Foundation scholarship program promotes the education of Virginia citizens in technical fields with a natural resource conservation and environmental protection emphasis. The program provides financial support to students majoring in or showing a strong desire to major in a course curriculum related to natural resource conservation and/or environmental studies. 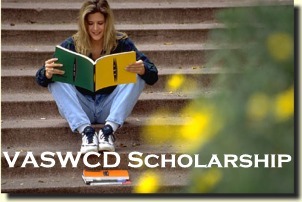 Annually the Foundation provides four $1000 statewide scholarships in addition to the many local SWCD scholarship opportunities. 2019 Prospective scholarship candidates – Individual applicants must be full-time college freshmen or high school senior students who have applied to a college freshman level curriculum. Applicants shall document a class ranking in the top 20% of his or her graduating class or a 3.0 or greater Grade Point Average or appropriate equivalent of individual scholastic achievement. The applicant’s most recent official high school transcript must accompany the application. A copy of a school transcript will not be accepted. Applicants shall demonstrate active interest in conservation. We encourage applicants who were high school seniors in 2018 to apply again in 2019 as scholarship guidelines allow those “enrolled in a freshman college curriculum or applying to a college freshmen level curriculum” to be considered. Contact your local SWCD or the Association office for an application specific to your Soil & Water Conservation Districts. VASWCD applications are due to your local SWCD usually by early March and must follow their deadline, guidelines and restrictions. To determine your local SWCD contact VASWCD staff at 804-559-0324 or Find your Local Soil & Water Conservation District here. Virginia Soil & Water Conservation Districts – The 2019 Scholarship Application can be downloaded here and is due to the VASWCD no later than March 27, 2019. Local SWCDs may add questions and local deadlines to the application, but all questions included in the application must remain for students to be considered at the state level. Four $1,000 scholarships will be given statewide. Districts may make as many copies of the scholarship application as needed. Submitted applications must be completed in its entirety for consideration by the Foundation Scholarship Review Committee. We request your assistance in publicizing the VASWCD Foundation scholarship program with high school seniors and college freshmen in your area. When distributing the applications, please request they be returned to your district office. Each district is to then select one applicant, then forward that application to the VASWCD for consideration of a statewide scholarship. The VASWCD suggests that applications be due to your local SWCD by March 1, 2019 to allow for proper review before choosing and sending one application to our attention though this can be changed at your discretion. Your scholarship applicant chosen to be sent to the VASWCD for consideration can be sent via mail, scanned and sent via email, or faxed to 804-559-0325. Also, please be sure to insert your district name, address, and contact person in the space provided on the application form.